Pamelia Lake Trail is one of the best day hikes in Oregon. One of the biggest draws of this hike is the wonderful stream that meanders along the right side of the trail. Because the stream is fed by the surrounding mountains snow melt, this stream has a slightly different character and intensity depending upon what time of year you do this hike. This factor makes this a hike that is fun to do a couple times a year. The trail is around 5 miles in total length. Two and a half miles in to a sweet little lake that is nestled within the bowl of the surrounding mountains and another two and a half miles back out along the same trail. Once you get to the lake you can add another mile or so to the hike by hiking around the lake. The trail is not a difficult one and provides many interesting things to look at along the way. There are many areas along the trail with easy access to the stream. You will walk among a nice combination of disiduous and coniferous trees. Trilliums abound on this trail along with many other wild flowers. The lake is quite still and a good place to sit and look for fish, we can almost guarantee that you will see some. This is a very satisfying hike and provides a lot of enjoyment without a lot of work. Wilderness permits are required. You can obtain them for free at the Detroit Ranger Station. You will need to pay $3.00 for a parking permit. You might want to call ahead and reserve your permit as visitation to this secluded lake is limited. 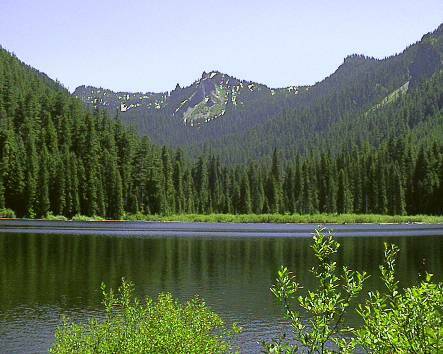 Pamelia Lake is located 7 miles north of Detroit, OR. From Salem, OR, take Oregon State Highway 22 to milepost 68 turn left onto Pamelia Lake Road.. The road is a narrow but paved, one lane with turnouts. There are limited bathroom facilities and no running water.